The moon has changed since humans last stepped foot there in 1972. “A New Moon Rises,” a traveling exhibition from the Smithsonian, highlights the dramatic landscapes captured by the Lunar Reconnaissance Orbiter Camera (LROC) from Apollo landing sites to majestic mountains that rise out of the darkness of the lunar poles. The exhibition launches a 10-city national tour at the South Florida Museum, a Smithsonian Affiliate, in Bradenton Oct. 20. It will remain on view through Jan. 13, 2019. Other host museums on the tour include the Huntsville Museum of Art in Alabama, the Washington State Historical Society in Tacoma and the Sam Noble Oklahoma Museum of Natural History in Norman, Oklahoma. Visit sites.si.edu for more details on the itinerary. 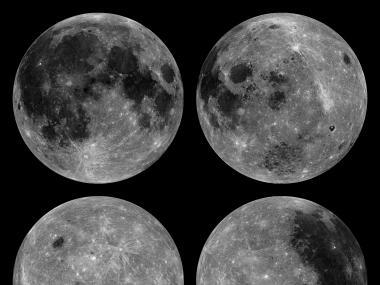 “A New Moon Rises” features 51 large-scale and highly detailed photographs of the moon taken by the LROC between 2009 and 2015. These images reveal a dynamic place with impact craters, recent volcanic activity and a crust fractured by the shrinking of a still-cooling interior. The images provide unique views of the lunar surface that not only help answer questions about the moon’s formation and evolution but reveal stunning landforms both alien and familiar. Launched by NASA in 2009, the Lunar Reconnaissance Orbiter (LRO) spacecraft studies the moon from orbit. The LROC Narrow Angle Cameras have taken more than a million high-resolution images. Although originally conceived to help prepare NASA to send astronauts back to the moon, LRO’s extended mission is now scientific research, exploring Earth’s nearest celestial neighbor in ways never before possible. For example, LROC scientists have discovered small lava flows that are evidence the moon may have been volcanically active as recently as 100 million years ago and young faults that suggest the moon is tectonically active today. taken by the LROC would be chosen for display. Visitors will also see new images from LROC on a monitor that will updated regularly. “A New Moon Rises” was developed by the National Air and Space Museum’s Center for Earth and Planetary Studies and the School of Earth and Space Exploration at Arizona State University. The national tour is organized by the Smithsonian Institution Traveling Exhibition Service (SITES). As a proud Smithsonian Affiliate, the South Florida Museum helps build bridges between its community and the national heritage preserved and displayed at the Smithsonian. Together, they strive to reach larger audiences with stories that stimulate curiosity and inspire learning.